Is the unique connection between East and West at London ramen restaurant Tonkotsu and at Mondo Brewing, a Japanese-inspired English craft brewer, a symbol of the future UK-Japan relationship? At a time of global geopolitical uncertainty, the United Kingdom's focus on Japan and recognition of the similarities between these two island nations could bring a stronger connection, greater economic security and richer cultural integration. It was over 400 years ago that the first English person stepped ashore in Japan. Today, the increasing closeness between Japan and the United Kingdom is a shared priority. Everything's connected, from business to food and culture. Under Prime Minister Shinzo Abe (serving since his 2nd election to the post in 2012), Japan has devised a range of economic reforms and policy changes – stimulus packages, revised monetary policy, de-regulation and new free trade agreements designed to drive growth. 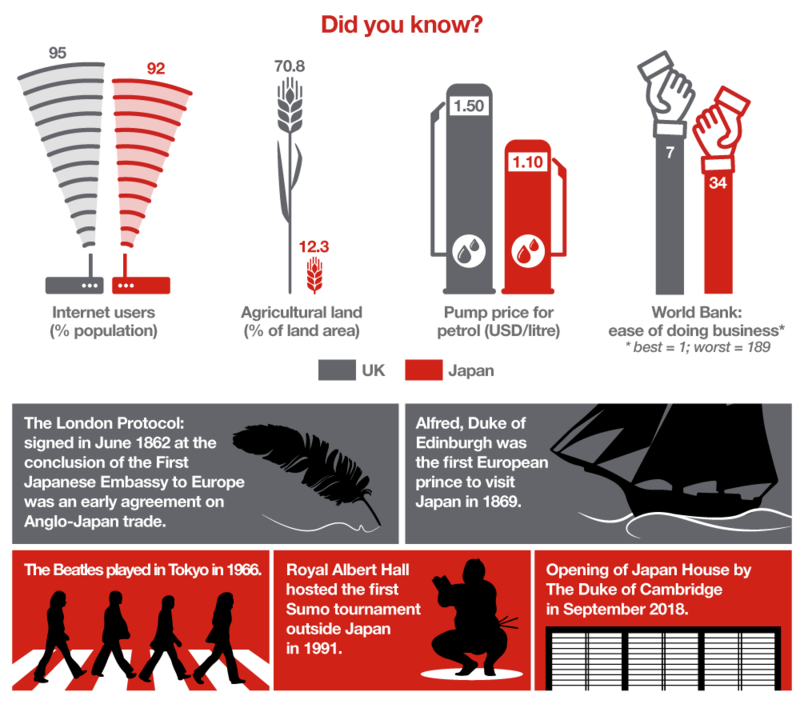 Financial services are the UK’s largest export of services to Japan, valued at £2.6 billion in 2013. Transportation and insurance are also significant, with a combined value of £0.8 billion. Other important service sectors are legal, accounting, advertising and R&D. 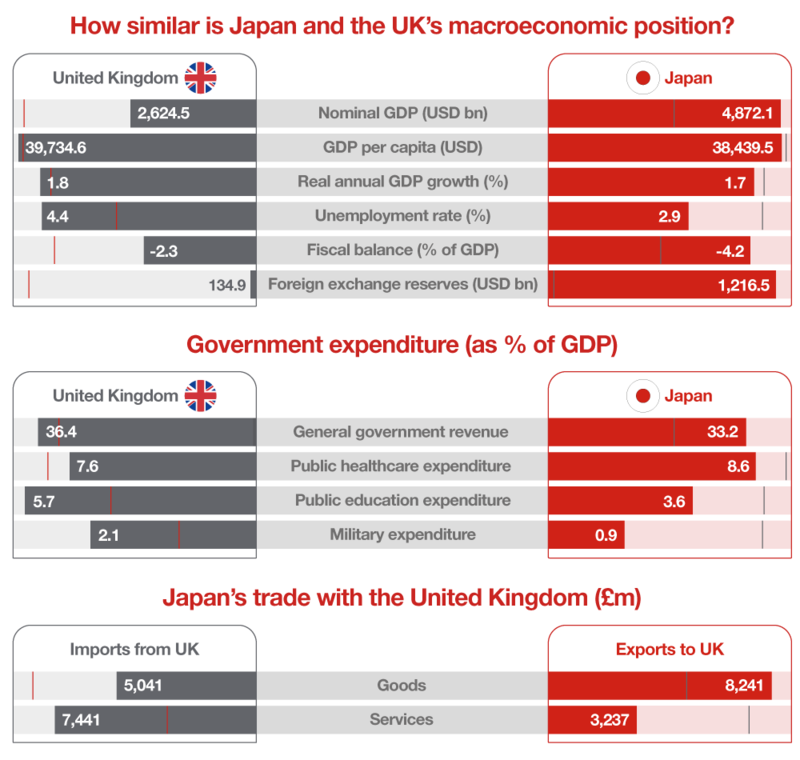 The UK’s biggest visible exports of goods to Japan are machinery and mechanical appliances, boilers, nuclear reactors, power generation equipment and vehicles, chemicals, including medical and pharmaceutical products. With around 450 British companies now operating in Japan, ranging from major FTSE 100 companies to small businesses, retail precincts across Japan now include British high street brands like Lush, Ted Baker, Burberry and Fortnum & Mason as well as specialist companies like BrewDog. Larger multinationals such as Barclays HSBC, GlaxoSmithKline and Rolls-Royce also have a strong presence in Japan. In Europe, Japanese businesses have created around 440,000 jobs. Nearly 1,000 Japanese companies are based in the UK, employing approximately 150,000 people. In fact, investment in UK (stock) from Japan reached a record high in 2017 at ¥17,020 billion and the UK was the second largest destination for Japanese investment after the US. 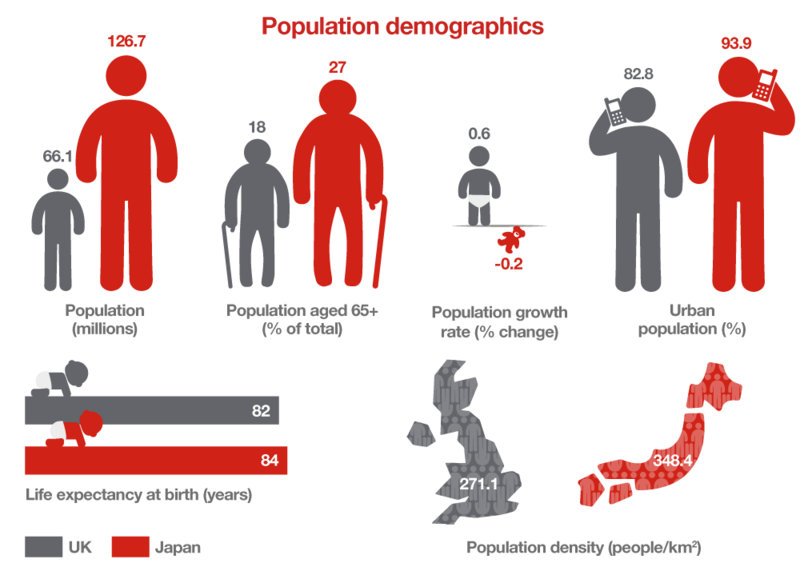 How different are the demographics of Japan and the UK? The Japan-UK Season of Culture, taking place in 2019 and 2020 to bridge the Rugby World Cup 2019 and Olympic and Paralympic Games Tokyo 2020, will see both countries collaborating in the areas of culture and creative industries. The Season plans to bring together artists, technologists, researchers and business, building new Japan-UK networks to drive innovation. Enhancing future trade and investment relationship: Championing the Japan-EU Economic Partnership Agreement (EPA) and working quickly to establish a new economic partnership between the two countries. Improving market access: The UK will work closely with Japanese businesses and government to build on the many high value and high profile Japanese investments in the UK, including non-tariff measures for both countries. Advocating global free trade: Both countries recognise the importance of regional trade deals as steps towards eliminating global barriers to commerce and will work together to progress plurilateral agreements. There is shared agreement from Japan and the UK to partner on industrial policies, specifically on innovative economies of the future. Additionally, dialogue on nuclear plans intends to cover nuclear policy, decommissioning and decontamination, research and development, public communication, safety and regulation. The health stream will focus on antimicrobial resistance, dementia and patient safety and to explore new areas of potential collaboration. In the areas of science and climate change, Japan and the UK will continue the Joint Committee meetings that started in 1994, based on the Agreement on Co-operation in Science and Technology, that has consistently identified new areas of scientific cooperation between the two countries. The Declaration also includes a commitment from both governments to action on climate change and the effective implementation of the Paris Agreement. See the Japan in focus insights and access Nomura's Global Research Portal for Nomura’s full research coverage. Thanks to our partners at Tonkotsu, Mondo Brewing and Bloomberg for sharing their story of how they're finding a home for the best of Japan in the United Kingdom, and our hosts at Brigadiers London and Bloomberg Arcade. Source: Department for International Trade; Foreign & Commonwealth Office economic factsheets (all data refer to 2017 or most recently available). Explore how our truly integrated, cross-asset platform and range of advisory, underwriting, risk solutions and capital-raising services to corporate, institutions, governments and public sector organizations delivers results in markets East and West. We’re always looking for opportunities born out of connected ideas. Whether they are found in emerging markets or empowered by new technologies, focused on Japan or dedicated to managing volatility.